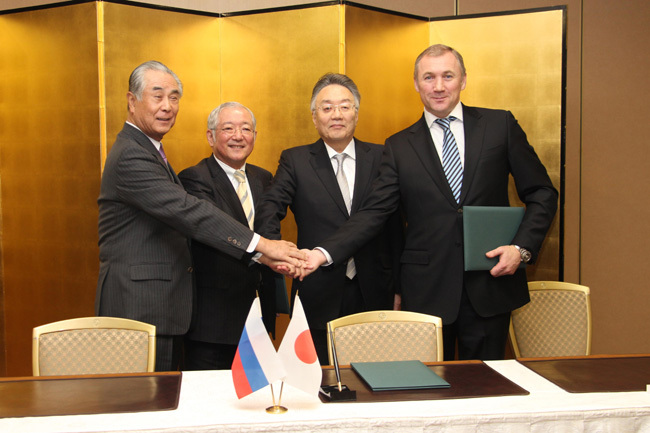 On December 16, 2016, Sojitz Corporation (“Sojitz”) signed a memorandum of intention (“MOI”) with PJSC “Khabarovsk Airport” (“KHV”), Japan Airport Terminal Co., Ltd. (“JATCO”) and Japan Overseas Infrastructure Investment Corporation for Transport & Urban Development (“JOIN”) to confirm its commitment to further joint cooperation on discussions to establish and operate a passenger terminal at KHV located in the Russian Far East region. Sojitz, JATCO, and JOIN plan to form a business alliance to co-invest alongside KHV in a joint venture company in Russia, which will develop and operate a new passenger terminal at KHV. As part of Japan’s efforts by both the public and private sector to promote high-quality infrastructure investment overseas, this project aims to contribute to the development of the Russian Far East region. Following the conclusion of this MOI, Sojitz will move forward with its Japanese partners to accelerate discussions for reaching a final agreement on the project with KHV. Participation in this airport operation project will diversify and create new value for Sojitz’s businesses by utilizing the company’s expertise in various fields, beginning with Sojitz’s airline-related business. Sojitz plans to expand its airport infrastructure business and enhance the company’s long-term earnings capacity.